Anastasia Lin: After seeing your two films for the “Midsummer Nightmare” event, I actually have to cop to the hype and ask…how do you do it? How do you keep finding such astonishing material? Don Malcolm: Some things just fall into place. You go with it. We’ve had a lot of help. AL: These were two films you might have shown in a FRENCH HAD A NAME FOR IT festival, yes? DM: Obviously that’s what would be expected. But for San Francisco we’ve had several shows that cover a lot of the French noir time span—early 30s to mid-60s—and the time has come to narrow the focus. We’re doing the 1950s in Number Five this fall. And the plan is to feature the 1960s in Number Six. But when LA FILLE DU DIABLE and MACADAM finally became available to screen, I knew we couldn’t in good conscience let them languish. AL: And isn’t this also your featured actress’ [Andrée Clément] centennial year? DM: Indeed it is. It’s sad to note that she is not getting a retrospective in France this year. That added urgency to our efforts. AL: And, I must say, this is a very special actress, with astonishing talent and intensity, and a tragic life story. DM: All of which made me want to single her out. AL: The quotes in your essay (to be given out at the show) about her demonstrate just how much regard her peers had for her—it’s clear that the French actors’ community was knocked out by her. DM: She began on the stage, working with Jean-Louis Barrault—who’ll be recognized immediately by film buffs for his iconic role in LES ENFANTS DU PARADIS (THE CHILDREN OF PARADISE). Later the veteran actor Fernand Ledoux became involved in her ongoing development. AL: And you think it was Ledoux that got her involved with the first film you’ll screen on the 26th, LA FILLE DU DIABLE (THE DEVIL’S DAUGHTER]. DM: Yes, no question about it. 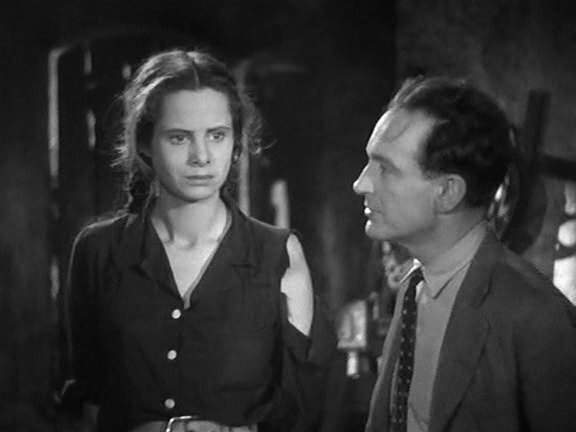 Andrée Clément had already been noticed for her stage work and had made a brief but compelling appearance in Bresson’s first film LES ANGES DU PÉCHÉ (ANGELS OF SIN). But she contracted tuberculosis right afterward and was forced to leave Paris to recover. Otherwise it might have been her instead of Maria Casares who played Barrault’s wife in LES ENFANTS. AL: You say that when she came back in 1945, she was almost scrawny. DM: Yes, and that worked in her favor for getting the role in LA FILLE DU DIABLE. She was already 26, but she looked underfed—the template for the modern “Goth Girl”—slim, dark, brooding, mad against the world. Ledoux was close with [director] Henri Decoin, and he was to play one of the lead roles in the film. He lobbied hard for her, and she got the part. AL: And the rest is history. DM: The film was a critical sensation. And with it being named as it was, it brought all the attention onto her. It is a simply astonishing performance. AL: She became what we might call the Kristen Stewart of her age. DM: Yes, except with a great deal more talent and range. She quickly demonstrates that in MACADAM, where she’s a long-suffering good girl trapped in her mother’s seedy Paris hotel. AL: Without giving too much away, I must say that she seems to be very handy with a gun. DM: Those type of remarks are the ones that always get ME in trouble! I hope folks will forget you said that when it comes time to watch the film—but it’s interesting to note that in an interview, Clément lamented the tendency that filmmakers had to give her parts where her character is connected to a gun. AL: What can you tell us about MACADAM? DM: It’s the first great Parisian noir after World War II. This was a fraught time in France, with a lot of revenge and reprisal underway for real and perceived collaborations with the Nazis. MACADAM grounds noir back in an urban environment, on the streets and in the bistros where shady men conduct their business with painted ladies, and the name of the game is l’argent. DM: Interesting to note that Signoret is actually several years younger than Clément, but their looks and character types are such that she seems so much older. This is a role that got Signoret noticed—it was just a couple of years later that she became a major star. 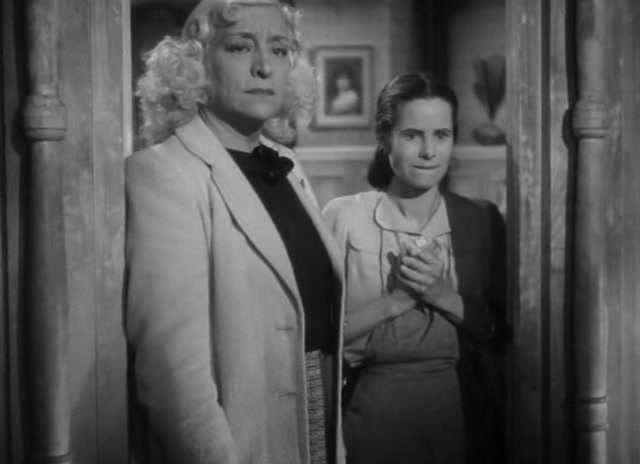 Rosay, of course, was tailor-made for her role, and actually rewrote some of screenwriter Jacques Viot’s lines to sharpen her character’s presence. She knew they had something, and so she left nothing to chance, pressuring the film’s producer to hire her husband, the veteran director Jacques Feyder, to supervise the production. Some sources suggest that it was Feyder who came up with the film’s witty final scene. And that’s a component of MACADAM that displays one of the key differences to be found in French noir, as opposed to any other. It has genuine wit, and characters who know and appreciate it—and who employ it as a way to operate in the sordid world they’re inhabiting. I think audiences who’ve spent the last decade saturating themselves in American noir are ready for this refreshing difference. MIDSUMMER NIGHTMARE DOUBLE FEATURE—featuring “Goth Girl” Andrée Clement. For more information go to Midcentury Productions and Roxie. LA FILLE DU DIABLE (DAUGHTER OF THE DEVIL) Premiere: April 1946 (France), February 1949 (USA) Directed by Henri Decoin. A notorious gangster (Pierre Fresnay) makes a spectacular escape from an ambush during a robbery and goes on the lam, obtaining a ride from an inebriated driver who eventually crashes the car into a tree near a remote village south of Paris. He assumes the identity of the man (killed in the crash) and enters the village for medical attention, where the local doctor (Fernand Ledoux) recognizes him. Instead of turning him in, the doctor coerces the gangster to provide funds for various public works and charitable efforts on behalf of the town in exchange for his silence. At the same time, the gangster is introduced to a strange young girl who is masterminding the activities of delinquent youth in the village. This girl, Isabelle (Andrée Clément), is the daughter of a disgraced community member who has been hounded into committing suicide, and her outlook on the local town and the nature of the world in general is beyond bleak and bordering on outright nihilism. The gangster becomes intrigued by the girl and begins to realize that he needs to re-examine his own life in light of the psychological destruction that she has experienced. A surprising and provocative revelation about the girl with respect to the gangster becomes the initiating agent for the film’s denouement, which is simultaneously redemptive and transgressive. Director Henri Decoin, picking up from his noir-stained films during the Occupation years (LES INCONNUS DANS LA MAISON, L’HOMME DE LONDRES), begins a run of three atmospheric and extreme psychological studies with LA FILLE DU DIABLE (we have already screened his follow-up film, NON COUPABLE, in THE FRENCH HAD A NAME FOR IT 3). Decoin had a highly variable career, but in films such as these, when working with extreme characters in unusual situations, he provides an examination of human nature that is in its own way as dark and complex as those achieved by directors such as Henri-Georges Clouzot and Julien Duvivier. 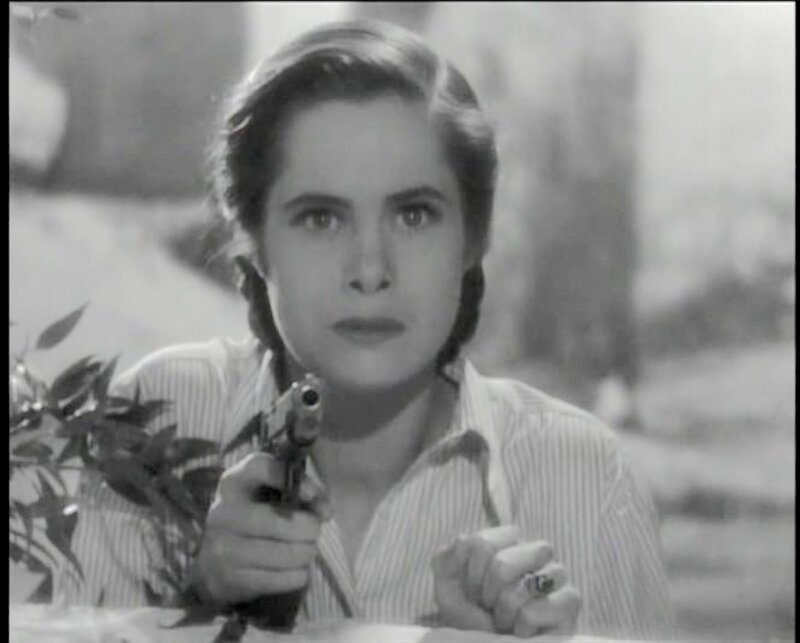 LA FILLE DU DIABLE is one of his most intriguing works and will eventually be seen as one of the key films in the recasting of French film noir in the immediate aftermath of WWII. Madame Rose (Françoise Rosay) runs a seedy hotel in a suburb of Paris. She makes her long-suffering daughter Simone (Andrée Clément) work as a chambermaid for nothing more than room and board. Strong-minded but without the least moral scruple, she once killed her husband whose honesty was a hindrance to her business. Under a suspended sentence, she now indulges in smuggling. One day, Victor Ménard (Paul Meurisse), one of her former accomplices hounded by the police, finds sanctuary with her. During a drinking spree, he has the bad idea to entrust to her a suitcase filled with bank notes, a loot with which Victor hopes to rebuild his life in South America. In the meantime, Simone becomes smitten with a sailor turned street vendor (Jacques Daqmine) and hopes that he will return her feelings, but his head is turned by Gisele (Simone Signoret), a call girl in search of a way out of her “profession.” In the midst of this romantic triangle, Rose’s dormant motherly feelings for Simone finally resurface, and she promises to leave Paris so that the two of them can start over again. Director Marcel Blistene was handed a witty, cynical script by veteran screenwriter Jacques Viot, a past master at mixing romantic and criminal intrigue (Le jour se leve). Taking no chances, Françoise Rosay convinced producer Eugène Tucherer to hire her husband, director Jacques Feyder, to supervise the production. Feyder’s first act was to borrow photographer Louis Page from his standing association with Jean Gremillon, thus ensuring a gleaming look, plenty of odd angles, and carefully composed scenes for both action and character development. The result is a film that recasts the classic pre-WWII tropes into new rhythms perfectly aligned with the grasping characters and the inevitable trampling of the innocent and virtuous. Anastasia Lin is currently shuttling between London and Madrid, revising her second novel #YouToo while pursuing post-doctoral studies in literature and caring for her aging Spanish mother. Don Malcolm is nearing completion of his book 589 French Films Noir Can’t Be Wrong!, which will tell the “true story” of film noir and of its underlying impetus in French film from the 30s to the 60s. Read Malcolm’s appreciation of Andrée Clement on the brochure given to all attendees to the Midsummer Nightmare Tribute. You can get a sneak preview of it here. Michael Guillen’s in-depth interview with Malcolm about French Noir at The Evening Class is essential reading. This entry was posted in Film: Interviews, Films, Films: Classics, Films: Festivals, Films: Noir, French, Roxie Theatre. Bookmark the permalink.